‘Twas the week between Christmas and New Years, and once again it’s Ted’s pick. And once again he takes us to a busy place near the mall in Fairlawn. Anyone remember last year when we tried visiting two different new places, only to find them both full of holiday celebrations .. and finally ending up at the all-you-can-eat sushi buffet down the road? Yeah, you may not, because I didn’t write a post for that evening. Mainly because I couldn’t keep up with the guys filling their plates in their seemingly never-ending quest to be full of sushi. So instead this year we get to witness their never-ending quest to be full of pizza. The only thing Shane may like more than sushi in this entire huge world of food. Spoiler alert: at one point in our evening at Dewey’s our group of five adults had four pizzas and a calzone on the table in front of us. No, we don’t overindulge when we eat. No way. And before anyone points it out, yes, we get the irony of Ted being the one to pick a place that specializes in things covered in or filled with cheese. He did this to us last year with Melt, too. I think it’s his way of keeping us on our toes. Or maybe we really are running out of places to pick after 3+ years of doing this. The wait at Dewey’s actually wasn’t too long when we arrived, and I think the fact that we had to wait at all had more to do with us being a large group of five in a place that’s pretty small for a local chain restaurant. It’s set up pretty similar to the ones in the Cleveland area, but this one is kind of like dollhouse sized compared to their regular adult sizes. I’m not sure why they have a bar at the back of this one, either. Seems like wasted space where they could’ve – I don’t know – put more tables. Or something. Just a thought. I mean, you only serve like six craft beers and some select wines, do you really need a horseshoe of barstools around the cooler? Are people seriously just saying “Hey, let’s pop into Dewey’s and get one of these six beers that I’ve really been craving today?” Or are there people out there who can’t enjoy alcohol and food unless they actually sit at a bar to partake in it? On the topic of poor design … so originally our group ended up being crammed into a booth, I believe maybe just for the sake of seating us and getting our orders in since pizza can take a hot minute to prepare. Or maybe we looked like the type that would cause trouble in the waiting area if left alone for too long. Who knows. But I think as soon as the server heard our order of enough food to feed an entire youth football team, she knew this seating arrangement wasn’t going to be a good fit. Or rather a fit at all. Simple math tells you that four pizzas that are each 11 inches or larger do not fit on a booth table. Hell, we barely even fit in the booth ourselves – as it was Ted was moored to the end of the table by a single chair. We joked that he might have to set up his dinner on the stack of high chairs off to his right. Because that seems appealing. It was also about a billion degrees in that corner. Or maybe it was just the body heat of all of us crammed in there. I mean, I appreciate a tropical island temperature as much as the next person, but not when I’m dressed for the -10 wind chill that is NE Ohio in late December. In any case, we enjoyed our first round of beers on this, our own little tropical oasis, as well as mine and Cassi’s peppercorn ranch side salads that we ordered as appetizers. Or, rather, one large salad that we ended up splitting after the server suggested it would be cheaper for us to just to that than get our own individuals. Good call. I appreciate frugality. Especially when we’re on this tropical vacation and all. Hey, a bigger table opened up! So what if maybe the server had to obviously stare down another large group, or inconspicuously whisper to them that they would offer up a handful of gift certificates to make them leave and make room or us, since the laws of physics weren’t going to allow us to eat in our current situation without one of us placing their meal on the floor. I can only say that I’m somewhat surprised we didn’t topple our current table as we all jumped to our feet at once as soon as another server arrived at our table and announced that we could move if we wished. Let’s just say that was a true blessing, because this new, larger table still came close to almost causing one of us to eat out of our laps. I mean, we could probably create one of those math word problems just to figure out the exact size of our table (“If five people order four pizzas and they cover the entire width of the table, how large must the table and the pizzas be if the sizes can only be 11, 13 and 17 inches?”) But I don’t like math, so we won’t go there. A nice feature of Dewey’s is that they have an entire menu of specialty pizzas, and you can split any pizza in half, no matter the size, so that you can try a few different specialty pizzas at once. Or plausabily split one pizza with a larger group who may disagree on what they want to order. But we wouldn’t know anything about that theory. Obviously. So with all those options, it makes total sense that Ted got a full Don Corleone pizza. Just one kind for all 13 inches. No splitsville for him. At least he’s definitive. Jason got the half southwest BBQ and half Bronx Bomber. His was a 13 inch as well. I guess I lied before. Here’s a few more vegetables. Not wanting to play favorites on who would be his “food soul mate” for this trip, Shane chose half of his as the Don Corleone, and half Bronx Bomber. So if you’re following along, that’s half of half of Jason’s and half of Ted’s. Remember that whole thing I mentioned about being able to split pizzas when people at the same table want the same order? This also explains why all of our pizzas look somewhat similar. Trust me, I’m trying to keep up, too. Well, OK, so you can tell which one is Shane’s pizza because someone (read: me) convinced him to get the 17 inch. You know, the largest one. For himself. This is what good wives do, people. Take notes. Cassi got the 11 inch half porky fig and half caprice. Hers is the baby pizza on the table. Look at all that cheese. It’s probably good this was on the complete opposite side of the table from Ted. Meanwhile I got a calzone with pepperoni, mushrooms and banana peppers. Partially because even though – as I’ve already stated – I don’t do math, my numbers-hating brain could deduce that another pizza was not fitting on this table. We all agreed everything was good. Perhaps the best praise of the night was when Ted said it was “one of the better pizzas he’s ever had.” And that’s even with cheese, people. *gasp* Of course he had to refute the cheese comment by saying that there was so much meat on the pie and it pretty much overpowered anything else … so there’s that. Loopholes. Although he later changed his story, and claimed this was actually “in his Top 5 pizzas.” Not that he really knows what other ones would be on that list, though, since we all know this isn’t exactly his favorite meal. Maybe he just felt like Shane shouldn’t be the only one holding court in the list market. You can also judge our fondness for a place by how much we leave on our plates at the end of the night. In this case, all but one of us were all winners of clean plate awards for the evening. Jason was the first to finish his whole pizza. Cassi was going to save one slice of hers, but once Jason finished his off and there wasn’t going to be a take home box she just decieded to eat her last one and save the need. Ted also accepted the challenge and ate his whole pizza. But the last two slices were tough, and probably should’ve gone home with him. Shane was the odd man out, taking four pieces of his pizza home for later. That couldn’t at all be because someone convinced him to get the larger size or anything. Nope. It was about the time that they were clearing away our plates that I looked over and noticed another group of five at a table not far from us being delivered one 17 inch pizza for them all to share. Um, really? ONE pizza? They’re clearly amateurs. I think the place has potential – but unlike the other Dewey’s up in Cleveland, this one seems pared down a little and definitely caters to the “we’re shopping at the mall and want pizza but not from the food court because I want to have a beer with it” crowd. The ambiance isn’t so great, either. Our tropical corner booth aside, it just seems a bit sterile and uninviting. There’s no memorable background music or sporting events on large TVs – and with a large open space that kind of makes it seem cavernous when it’s just snippets of conversations rising up to fill the air. It definitely has an air of “eat and get out,” not “hang out and have another beer” to it – which, again, is why the bar is a bit baffling. But the pizzas are good, and I would definitely think of them as an option for take out after a shopping trip or on the way home from work. Just don’t make me do the math to figure out how many will fit into my car comfortably. 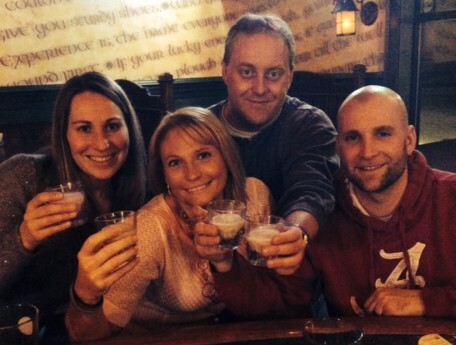 Oh, Hooley House. I remember when we first met, two years ago (almost to the day, ironically – what does it say about our timing when we continuously pick an Irish place in the weeks following St Patrick’s Day?) – we were so excited to finally get there, so filled with promise for what you could be for us … and then we left disappointed. In remembering that first visit, or main contention was … well … pretty much everything. The service was extremely slow, our glasses were left empty for 20+ minutes at a time – even when we were seated essentially right next to the auxillary bar, the burgers weren’t cooked to our individual specifications, and my chicken sandwich may or may not have been trying to kill me. But the apps were good, so score one for them there, I guess. At the time, we chalked it up to the fact that they hadn’t been open long, so they were probably still working out some kinks. Plus we also chose poorly on our seating for the evening, not realizing that there was another full bar and dining area with far more seating – and that was consistently beating us in the loudness and “sounds like fun is happening over there” departments – opposite from where we were sitting. But even with all those negatives, we still always talked about going back to give it another chance. Because we’re fair like that. This time around we knew right off the bat not to make the same mistakes in the seating department, and requested to head for the opposite site – otherwise known as the “East Eden” to our last visit’s quieter side. And while it was definitely an improvement, we also weren’t instantly in heaven. Maybe it was because we also happened to be there on trivia that night. And I think we’re learning that’s a whole different crowd on those nights … who don’t particularly care for people talking loudly when they’re trying to be all smart and stuff, and who shoot us looks of death when we have our cell phones on the table. Hey, listen, we’re taking pictures of food for important research, not googling your answers. Well, OK, maybe we’re doing that, too … but don’t worry, we heard the rules, and we’re not playing your little game anyway. We just like to pretend to be smart, too. Also, the girl hosting the trivia on this particular night had an amazingly monotone, still-not-loud-enough-even-with-a-microphone voice that was putting me to sleep. Because that’s good for bar business. So clearly we’re off to an amazing start already. But nevertheless, we ordered beer, because, well, that always seems like a good place to change the tides for the better. Ted started off with a Guinness. I asked which Leininkugel’s seasonal was on tap, since their “winter specials” table tents said Cranberry Ginger, but it’s after St. Patrick’s Day so that technically means spring in Ohio, and usually the Summer Shandy is out by now. The server’s answer pretty much ambiguously implied it could be either. Oh, OK. Well luckily I like either one, so whatever, I guess, just give me what pours out of that tap, please. Meanwhile, Shane ordered something from the same “winter specials” flyer that involved Guinness mixed with the seasonal Cranberry Leininkugel’s. Me: You know, if they don’t have that cranberry beer anymore, they won’t be able to make that drink. Shane: Oh, good point, you’re probably right. Sure enough, about two minutes later our server appeared with mine and Ted’s beers, and that exact message for Shane. Just call me Miss Cleo. So Shane ended up with a Michelob Ultra. Probably tasted exactly the same. Speedy Ted wasted no time and tried jumping right to appetizers as we were putting in the drink order, so Shane and I scrambled and just came up with our usual of late – pretzel sticks. Because really, if you mess those up we should probably just leave. Catches on quick, that one. Meanwhile Speedy Gonzalez over there had been so impatient to order because he had his eye on the Maple Glazed Bacon app – which he had spotted on another menu somewhere not WTGW related but never got to order then, so he was all about ordering it now. The app is really just what the name suggests – bacon strips cooked and coated in candied maple syrup. So basically kind of like your entire breakfast served in one cute little bar glass, and without the carbs of pancakes. We don’t ask for much, people. Really. As I mentioned already, we were once again coming off the corned beef fest that is an Irish holiday, so we may have been just a tad burnt out to order anything remotely Irish on the menu. Shane and I actually ended up with a bit of a southwestern theme between us – he ordered the beef quesadilla, which I made fun of him for ordering at an Irish place … and then I promptly turned around and ordered a spicy black bean burger. And just like our last visit to HH, the apps were better than the actual meals. We all thought our food was just OK. Ted thought his burger was alright, but that the tater tots were too salty. I also was not a fan of the tots – and that’s not a sentence I say many times. But I also just had really good tots at a restaurant in Chicago a few weeks ago, so that memory may have infringed on my opinion here. Look at those tots. Just look, though, because eating them isn’t recommended. My burger was OK, I liked that it had lots of avacado, and my bread loving self was of course a fan of the soft bun (that’s what she said …). But I could’ve done without the overload of onions that seemed to not want to be evicted from the sandwich. Shane said his quesadilla was also just OK, nothing special. Our server was good, very talkative and sweet, although she did disappear a few times when glasses were empty and not reappear until we were about ready to go up to the bar and order for ourselves. Do they teach that tick to all of the servers here? I seem to remember that disappearing act happening a lot on our last visit. But she also tried to give Ted an extra Guinness at the end of the night, so maybe that was her way of making up for it? I’d like to say we’ll return to find out, but that’s probably pretty doubtful at this point. The way things have been going with this place so far, the third time is either the charm … or one of us ends up with food poisoning. That’s a game of Russian roulette I’m not sure any of us are willing to play. OK, let’s be honest, do I even need to write a review here? I mean, this place has the words “tacos” (delicious) and “rum” (even more delicious) right in the title. Could anything be more up our alley? It’s like someone fashioned a WTGW oasis just to lure our group into its clutches. The only thing more appealing to us might be if someone opened a place just called “Cheap Wings and Beer.” I mean, really. So it’s probably no surprise that both Shane and I had been eyeing this place up since it opened a few months back. On many occasions we’ve been in the area and almost just broke down and stopped in for dinner, but were trying to hold out to use it as a pick. The struggle is real, kids. Bomba is located in the old Hudson’s Restaurant space in the Montrose Center in Fairlawn. Having been to Hudson’s a few times, I can say Bomba definitely gutted the place when they moved in, as it’s barely recognizable now that it’s been redone. Which isn’t necessarily a bad thing. I mean, Hudson’s was OK – but I always thought parts of it needed more lighting. Like they were going for that romantic date spot, but when a few of the tables around us had like four kids with them then the darkness just kinda came off as a bit creepy. No wonder the kids are crying, they can’t see what you’re feeding them. In contrast, Bomba has a great atmosphere, very open and much brighter. There was also patio seating, although we didn’t opt for that since it looked like the skies might open at any moment. And you know our luck there. So when you’re in a place that has the word “rum” in the title, it makes perfect sense that Ted gets a beer. Because, well, Ted. Well at least “Lagunitas” sounds Mexican, no? I mean, he did redeem himself later by switching to a mojito, but sheesh. Damage done. I got the Tropical Mango White Sangria, which sounded delicious on the menu but ended up tasting a little less so when I actually tried it. Kinda like those deceptive beer descriptions I always want to volunteer to compose. Jerrid got the Brazilian Red Sangria – which also sounded delicious – and he was far happier with that one than I was with mine. Check out the size of that berry! But it was Shane who once again won the drink lottery with the Blackberry Ginger Mojito. One sip and I knew that’s what I would be switching to next. It was similar to the mules we had at Caston & Main a few weeks back. He’s on fire with his choices lately. And for Amanda … water. Boo. 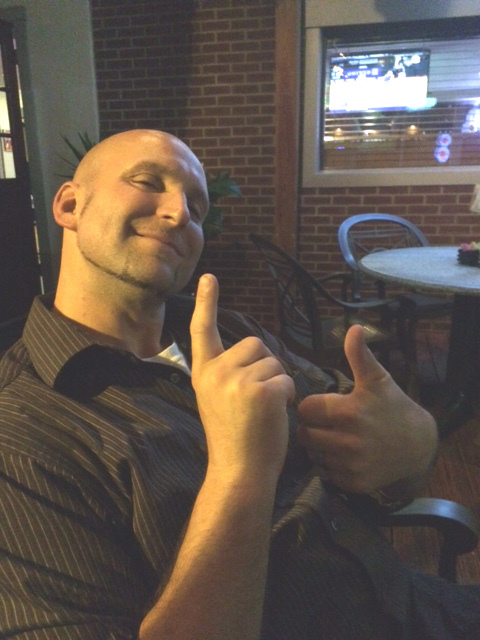 For appetizers, Shane and I picked the bacon wrapped jalepenos – which Shane liked but I wasn’t crazy about. I didn’t think they had much flavor. So either I got the lame pepper with no taste, or my taste buds are permanently scarred from weeks of hot wings. That’s not a hot dog. Really. Jerrid and Amanda got the beef empanadas. Which, aside from just being fun to say, were tasty. We also got an order of the fire-roasted salsa for the table (this is one of those “fancy” Mexican places where you have to order the chips & salsa/guac, they don’t just bring it to the table automatically) as well as the house made guac. Because it’s made fresh when you order it, they have stuff you can add in to make it your own custom mix. Our server was kind enough to suggest a few things that he usually adds to his … but we just went with plain for our first try. Because, honestly, some of the add-ins seem a bit strange. Candied pumpkin seeds? Chipotle honey? Goat cheese? We’re simple folks. Just bring us the green stuff to dip our chips in. For reals. At least I’m happy to say that we chose wisely, and the plain guac was really very good. As was the salsa. And most of the chips. Although I honestly can’t tell you which ones we liked least, because, as I mentioned, I still don’t think we really knew what we were eating. To tacos. So, remember what our table looked like last week at Cruiser’s with our little wing fest? Well, just picture that same thing for this week, but with tacos. So the gist of this place is that basically they have a bunch of different kinds of tacos, and they’re all a la carte, so you can mix & match. They’re all like $3 or $4 each, and they recommend 2-3 per person. And now comes the part of the review where I test my own memory and ability to take notes, since, well, let’s face it, pretty much all tacos look the same in pictures. I got the potato chorizo, braised beef and spicy shrimp, along with a side of mango cilantro rice. The spicy shrimp was definitely my favorite, it was for reals spicy – but in a you’re-killing-your-taste-buds-for-good-reason kind of way. I thought I would like the beef the best but when it turned out that it was primarily jalepenos, I decided that wasn’t so much a winner. The rice was delicious. Amanda had the blackened fish, potato chorizo and chipotle ground beef. She liked the chorizo the best. She and Jerrid also got a side of the adobo fries, which she hardly touched because the three tacos were enough to make her quite full. Ted went with the blackened fish (the server highly recommended this one and said that was his favorite … can you tell? ), crispy fish, smoked brisket and slow braised duck. He said the dusk was his favorite. He thought the blackened fish didn’t have much flavor (in your face, server). The other two were OK but the definite winner for him was the duck. Jerrid had blackened fish (seriously, I’m getting tired of typing that), bbq pork and smoked brisket. Agreed that the fish wasn’t the best. He liked the pork and brisket though. And then there’s Shane … who went the “Ted’s getting a beer” route for his meal, ordering the Smoked Brisket Torta (that’s a fancy way of saying sandwich – I only know that from reading it on the menu) with adobo fries. Or adobE fries, as he called them. Like the photoshop software. Because who doesn’t like a little lesson in filters and levels while they eat french fries. Whatevs. He said the brisket was a little dry, and he compared the bread to an English muffin. Hmm, that’s not so tasty. That doesn’t look like tacos. Where are we Shane? He did mention that he thought it would’ve been better with some guac on it. Because woudn’t everything really? Next pick: Amanda asked for a week off, since she just started this new job that puts her on a regular schedule and back to being with us on Wednesdays. So Ted’s up next week. Yes, I know, we’ve technically been to Ray’s before. But that was the Kent location. This is Fairlawn. This location is newer, with some added menu items. And trust me, Shane gave Ted enough of an ordeal about this very topic while we were out that we really don’t need to go into it here. Ha. Ted also got an earful because it surfaced that he had actually been at this same building back when it was a Winking Lizard. According to Shane, he’s just breaking all the WTGW rules this time around. Anyway, Ted thought he remembered a patio when it was the Lizard – but it turns out that they turned it into more of an enclosed sun room. So at least we weren’t going completely for patio dining tonight, even though we technically probably could’ve squeaked a patio night out of this one. Although with our luck and the way the weathe has been around here lately, it probably would’ve downpoured on us as soon as we ordered our drinks. Because nothing says welcome back from a week’s worth of beach vacation like a boatload of rain. Thanks Mother Nature. Another of Shane’s gripes about this Ray’s location – and I have to admit, something which we all found a bit odd – was that all of the servers were dudes. Like seriously, not a woman waitress in sight. It’s like the exact opposite of Johnny J’s over in Merriman Valley. I wonder if they did some big study that said they would get a different type of customer in if they only had frat boy looking male servers? Or was that just all who applied? Or are they all friends with the owner? Or maybe they only hire people named Ray? In any case, this Ray’s wasn’t busy when we arrived, so the hostess (who was also a guy. Seriously.) told us we pretty much had our pick of seating locations. Ended up in the aforementioned sun room area. Because, well, why not. The place has a pretty extensive draft beer list – and, even nicer, it’s readily available at each table when you sit down, thus knocking out all that “what do you want to drink?” “well what do you have on tap?” nonsense that we usually have to banter through when we first arrive. Of course we ended up with Summer Shandy for the girls. 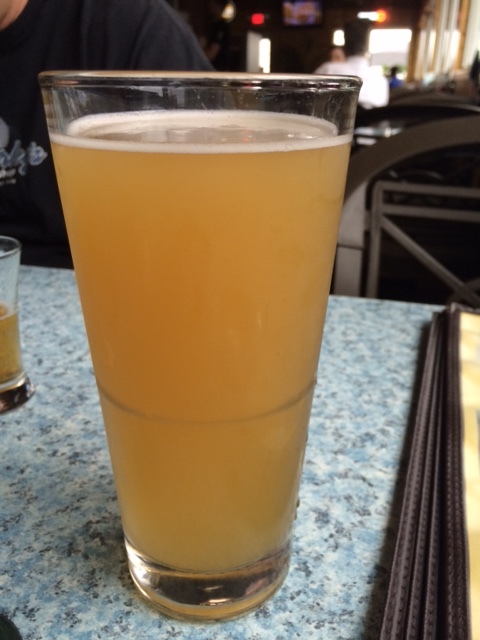 Ted ordered a Mill Street Lemon Tea Beer … which honestly did sound rather tasty. Enough so that it even prompted Shane to follow suit. Shane then proceeded to make a bitter beer face every time he took a sip. So I guess not so tasty after all, at least by Shane’s standards. Although he later ordered a second one, which surprised the hell out of us. I guess it all tastes better after the first round? Or he just likes making that face when he drinks. Whatevs. 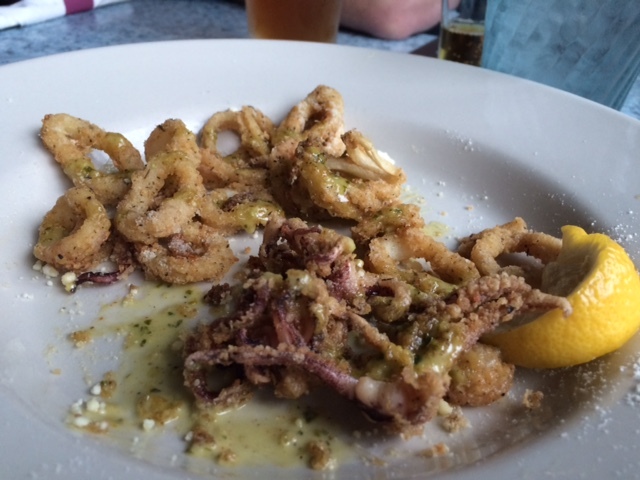 For our appetizer, we ordered the parmesan crusted calamari. 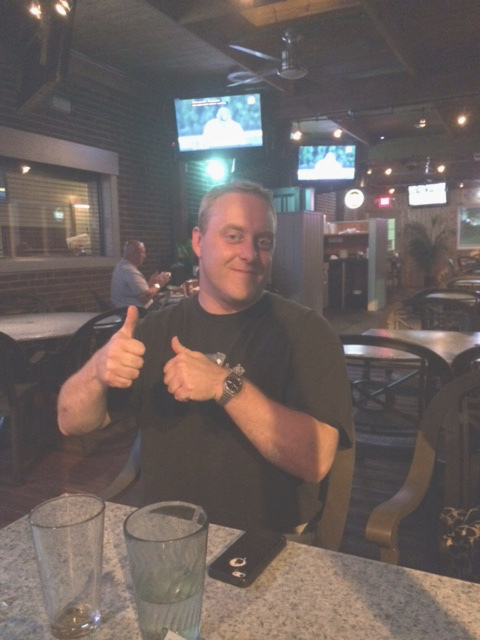 Because, well, it was on the menu, and by now you know that’s what Shane gravitates to. It was actually really good. So good, in fact, that we devoured over half of it before I remembered to snap a picture, so sorry for that. My bad. Hey, it’s hard to get back into this blogging thing after vacation, yo. In any case, it was just a touch spicy but not too much so, with a light breading and very good flavor. And there was a lot more of it on the dish before I snapped that picture. 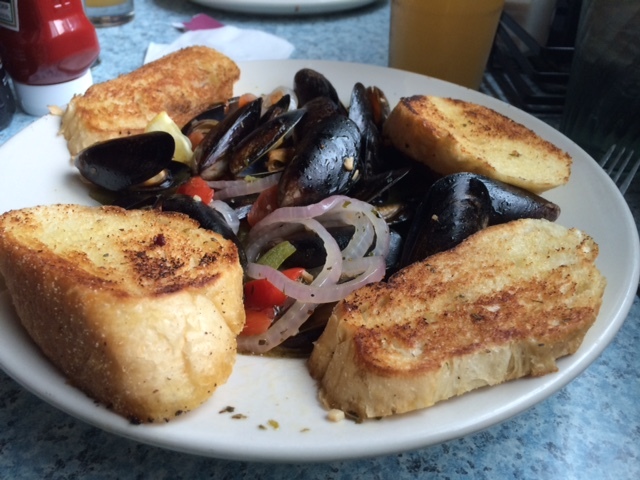 Keeping with the seafood theme – and because, honestly, after a week in OBX, we didn’t have nearly the amount of seafood (actually, let me clarify – good seafood) we thought we would’ve had – I ordered the steamed mussels. They were very good, served in a butter/olive oil/tomato broth that I actually wish would’ve had a little more girth to it, but was still tasty. I also wish they had gone with a crustier bread than Texas toast on the side, but it was still delicious. I come back to Ohio to order seafood. Because that makes sense. Wait, back up … did I just use the word “girth” to describe food? WTF is that about? 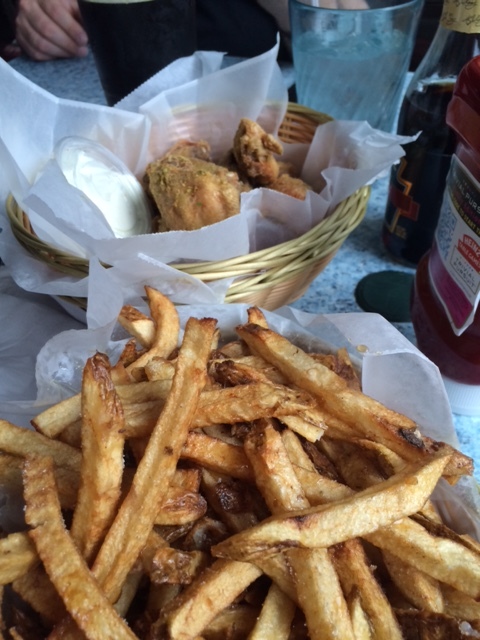 I also ordered a basket of fries, which I ended up sharing with Shane after the waiter heard him about to order one as well and warned us that it was about a pound and a half of fires in each basket and surely that would be enough for both of us to share. Um, right. Clearly he’s never met Shane or witnessed his eating prowess. But the server turned out to be correct. I think we even had fries left over. I know, shocked the hell out of me, too. Along with 3/4 of my fries, Shane also had the blue moon sandwich, which is a new item on the menu. 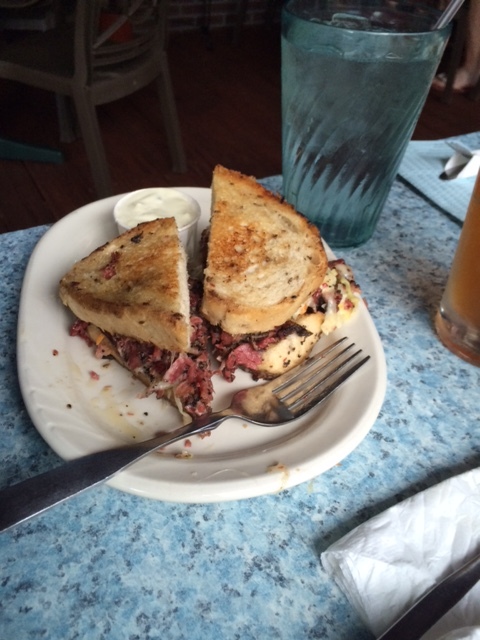 It’s slow roasted pastrami and Swiss cheese on toasted rye. And it’s delicious. I tried a sliver of the pastrami and was immediately jealous of his order. The third and final item on Shane’s side of the table was an order of 12 of the Wasabi dry dusted wings. Which he shared with Ted … um, hello, who is this guy sharing all the food all of a sudden? Last I knew, Shane didn’t share food. Interesting. In any case, they both said the wings were OK but definitely could’ve used more flavor, and not as hot as something with the word “wasabi” in them would imply. Shane’s shared fries and wings. Who is this guy? 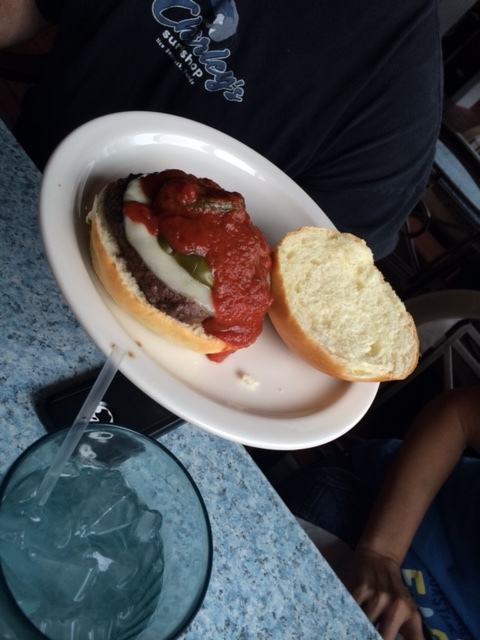 Ted’s supplement to half of Shane’s wings was the Italian burger, which he said was good. It was nothing special, but still good. Which I guess is better than absolutely awful, so there’s that. That’s marinara sauce, not an overabundance of ketchup. 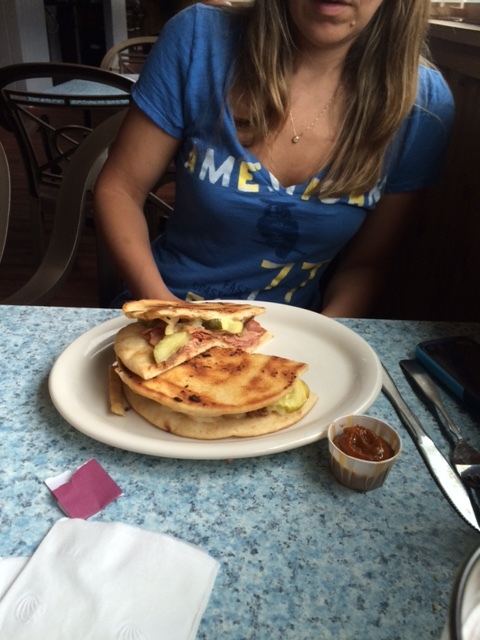 Amanda stuck with her usual – and the sandwich she got the last time we ate at Ray’s in Kent – the Cuban. She said it seemed to have a different bread this time around – it was served on more of a flatbread than the usual sandwich-esque bread that you would expect a Cuban to be served on. And she was thankful that the sauce was on the side because she said it would’ve ruined the sandwich if it had been mixed in. She requested regular mustard instead, and said that all in all it was a decent meal. It looks like a quesedilla. Did I say that the last time? So, remember what I said earlier about the place being like the opposite of Johnny’ J’s? Well, that seems to hold true in the gender of the servers … but not necessarily in the style of service they provide. At Johnny’s it seems to be that you don’t just get one server at your table – you get whoever passes by and happens to notice that your glass needs refilled, or that you haven’t ordered yet, or that you’re missing silverware … you get the idea. It’s the same concept here at Ray’s. We started out with what seemed to be one waiter, who got us our first round of drinks and brought our food and I think even our second round … but then somewhere along the way he just kind of disappeared. Maybe he wasn’t upselling us on enough drinks. Maybe his shift was over and he just forgot to tell us. Maybe it was his first day and as part of his hazing they shoved him in a back broom closet somewhere and stole all of his tips. Who knows. What we do know is that somewhere along the line he was replaced in part by a guy with hair in a man bun who appeared out of nowhere and cheerfully asked us if we needed more drinks. He was very talkative and knowledgeable about the beer selection (maybe the first guy just realized he couldn’t keep up with us alcoholics and Ted’s willingness to try anything on the menu with a strange name?) – so of course that translated into getting us to try all kinds of different beers. Which is always a good idea on a Wednesday night, right? Case in point, Shane was convinced to try something called Magner’s Irish Cider, which sounded good on the menu and in the explanation, but we all sampled and agreed that it was awful. I swear there were ground up flowers in it. For real. Me: It tastes like a funeral home smells. Because that’s a good marketing statement. 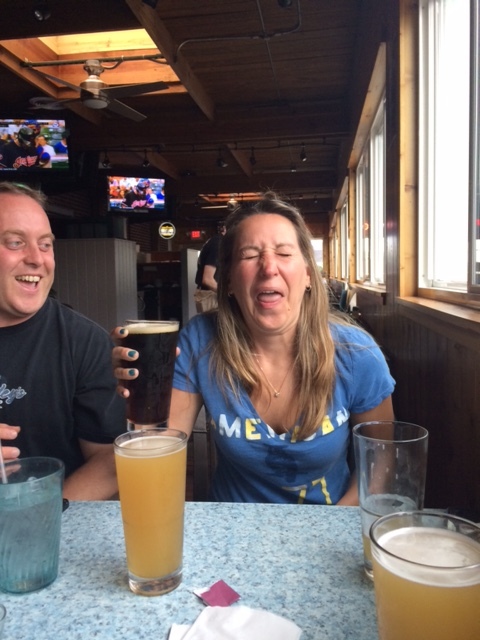 Speaking of which, Amanda also learned the hard way that you don’t try Ted’s beers, no matter how delicious those crafty marketers make it sound on paper. I lost track of what Ted was ordering but lets just say the beers got darker and darker until they rivaled the color of his shirt. And that’s not just because the lighting was disappearing in the sun room as the evening wore on either. Although I think this server’s proudest moment was when he convinced Amanda to relinquish her Summer Shandy for a grapefruit flavored shandy (the “Illustrious Traveler”). 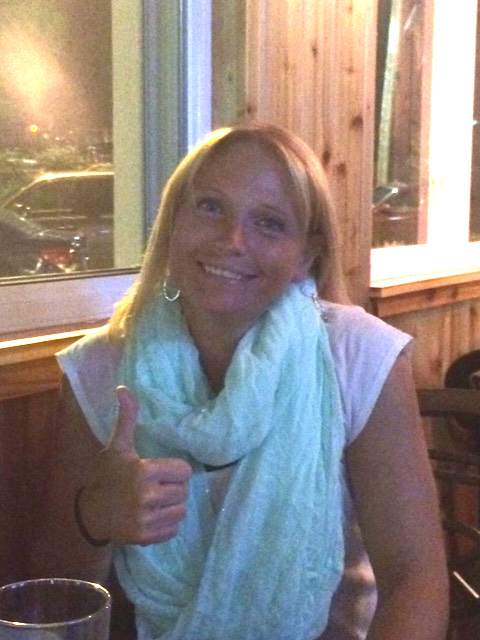 I had agreed to give it a try, after he talked it up to us as a nice “upgrade” from the Summer Shandy, although Amanda staunchly stood her ground and refused. Ted: You even covered your glass when he asked if you wanted to try something new, like he was going to just pour it in with your Summer Shandy. 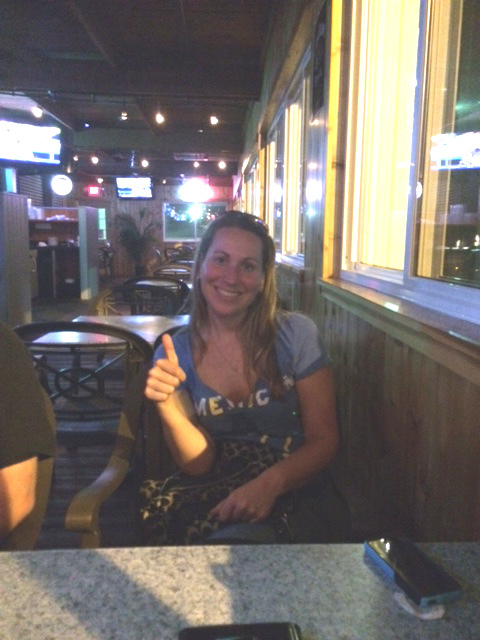 But lo and behold, Amanda sampled my drink, and declared it good enough to replace Summer Shandy for a round. I have to believe the server gave himself a pretty good pat on the back for that one. All in all, we liked this location better than the original Ray’s in Kent. The wait staff seemed to be much more personable (although we can’t forget that the one in Kent did go ask the cooks in the back about the mysterious spice Shane tasted in the wing sauce that he ordered there – thus sparking the infamous “is that ginger I taste?” catchphrase for our group) and with more room to move in the place it didn’t seem as much like they were just trying to turn over tables or shove as many people as they could in and out of the room during peak times. Definitely had a great time here, and the food was good. I’m sure we’ll be back. Drinks: Impressive draft beer list, which seems to rotate based on month or season. Bonus points for finally sending over the server that had a real knowledge of the list and could match our tastes to the beers. Food: A little of everything – sandwiches, salads, dinners, etc. Decent sized portions, and everything we tried was tasty. Overall: While I wish the sun room was still a patio – since I think this would up the frequency of our return visitorship – I’d still put money on us returning sooner rather than later. It would probably be a fun place to catch a game or just have drinks while out in the Fairlawn area.